If you're stuck for a gift idea for a car enthusiast, then this page will provide you with some great ideas. Here you'll find a wide range of retro car books featuring old cars from the 1980s, as well as classic and vintage cars from other decades, too. There are some excellent publications here, so why not treat yourself and have a nostalgic read in your favourite armchair - or wherever else takes your fancy! Simplyeighties.com is a participant in the Amazon EU Associates Programme, an affiliate advertising programme designed to provide a means for sites to earn advertising fees by advertising and linking to amazon.co.uk. Cars were changing dramatically in the 80s with fuel injection, turbochargers, computer-controlled systems and four-wheel drive taking the world by storm. In this fascinating book by award-winning writer Giles Chapman, you can relive everything car-related in the British Isles during the 1980s. The award-winning writer, Giles Chapman, gives us 160 pages of fascinating info on the cars that once graced the roads of Britain. Includes the Ford Capri, Renault 5, Reliant Robin and many, many more. This is the most popular book on the page and features over 200 pages of lightning fast cars, with a generous helping of facts, stats and photos. It's aimed at a younger audience, and would make for ideal gift for any car mad child. No less than 650 cars are featured in this great value book by Martin Lewis, including illustrations and comprehensive details of each car in alphabetical order. An informative read and this would make an excellent gift for any car fanatic. 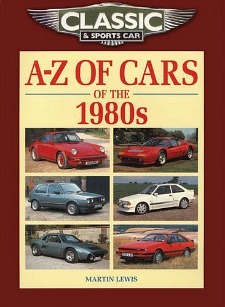 This 160 page hardback book covers old cars from the 50s to the 80s, and includes a wide-range of models. This is a real nostalgia fest compiled by Giles Chapman and Richard Porter, and it's packed with lots of photos of both British and foreign cars. Featuring 160 pages of the weirdest and ugliest cars you have ever seen! These cars will not only raise a smile, but your eyebrows too. Features a foreward by ex-Goodies star Tim Brooke-Taylor. A fun read and a quirky gift idea. Renowned motoring history expert Giles Chapman shows us why Great Britain has an astounding record for producing exciting, ground-breaking and popular cars. As the title suggests, you'll find detailed info with lots of pictures of 100 fantastic British cars spread across the book's 192 pages. Despite its simple title, this is an in-depth read from Dorling-Kindersley featuring 360 stylish pages. Over 2000 cars are covered and just about every type imaginable is included - there are even steam-driven cars! This is an impressive, high quality publication. This is a little gem! Containing 160 pages (with beautiful photography) that celebrate our love affair with the car. The authors passion for cars really shines through here, and It's nice to read a book that isn't aimed solely at petrol heads, and includes wonderful stories from owners who are truly in love with their vehicles. A great read! Featuring 288 pages of fifty British cars that are regarded as being significant by the author, from 1907 to the present day. All the greats are here such as Aston Martin, Jaguar and Rolls-Royce, and there are superb photos by the award-winning photographer Michael Zumbrunn. These are certainly cars to drool over, but if you are looking for lots of technical details then look elsewhere. This highly-rated book by Design Museum Enterprise Limited celebrates the most iconic cars that have had a real impact on British design. It's a quirky read that focuses more on imagery than in-depth reading, but is certainly not another run-of-the-mill car book. One nice touch is that the book itself has a nice, retro design that looks like it was printed in the 60s. The Capri was a 70s car that you either loved or hated. This temperamental beast gave boy racers the chance to realise their dreams without breaking the bank. This 128 page book from the award-winning writer Giles Chapman features lots of interesting facts and plenty of nice photos, too. This is an entertaining read that includes over 200 pages of the strangest cars ever made. This is a fascinating collection and a must-have gift for any petrol head! 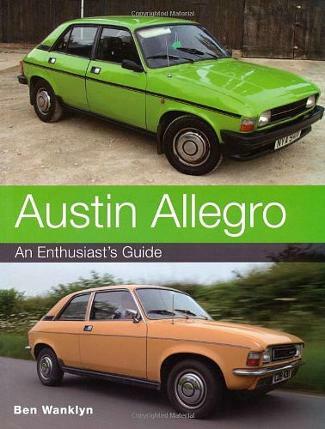 Okay, so this isn't the most in-depth car book around, but in its 128 pages you will find fifty of the most pathetic cars ever made inc. Austin Allegro, Yugo 45, Rover 800, Talbot Tagora, Skoda Estelle to name but a few. It's certainly a hilarious read, and a wonderful gift idea that is sure to bring a smile to a Dad or Grandad's face, at least. Good fun!